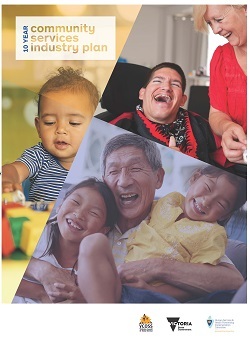 The 10-Year Community Services Industry Plan presents a unified vision for the Victorian community services industry and the actions required to achieve this vision. Victoria’s community services industry is strong, vibrant and mature with a proud history of supporting people facing poverty and disadvantage. Comprised of thousands of organisations spread throughout the state, the industry is diverse, resilient and adaptable. As one of the biggest and fastest growing employers and workforces in the state, it is also a major contributor to the Victorian economy. In addition to this, it engages an army of volunteers, bringing people together and building inclusive, resilient communities. National Disability Insurance Scheme and the government’s response to the Royal Commission into Family Violence. The 10-year Community Services Industry Plan seizes the opportunity provided by this change. Developed by the industry, for the industry, it seeks to ensure all Victorians can live good lives in thriving communities. Fostering the potential of all communities. Who is the community services sector? Why is industry planning being undertaken? What will the planning achieve? What was said during consultation? Victoria’s community sector charities work to support and connect people, strengthen communities and advocate for a fair and just society. The industry is comprised of around 4,500 organisations of varying size and scope and is comprised of around 150,000 people. It employs more people than other key industries such as mining, electricity, gas, water and waste services, wholesale trade, information, media and telecommunications and more. It is similar in size to transport, postal and warehousing and public administration and safety. The health care and social assistance industry (which includes most community services) currently employs around 412,000 people in Victoria and is the largest sector by employment in this state. It has had the fastest growth in employment in Victoria. Why was industry planning undertaken? Change has been constant for community sector organisations with dramatic shifts in the way services are delivered. There has been the onset of major trends and reforms such as the move to person-centred funding approaches which require services to be more responsive to service users, increasing demand for services, greater competition between providers, funding uncertainty and governments wanting to see the outcomes from the funding they provide. There is also increasing recognition that not one service type or sector is able to meet the holistic needs of people facing vulnerability, poverty and disadvantage. Traditionally there have been disjointed policy settings which have led to a fragmented and poorly coordinated service system, with services that do not ‘join up’ cohesively to deliver positive outcomes for people. The sector and government had the opportunity to work together to create a whole of Community Sector Industry Plan that articulated the vision and steps needed over the next 10 years. This long-term planning was complemented by the development of tailored transition plans that will address short-to-medium term reform implications for specific industry sectors, including child and family services, homelessness, social housing and family violence. The Centre for Excellence in Child and Family Welfare (CECFW), Community Housing Industry Association Victoria (CHIA Vic, formerly Community Housing Federation of Victoria) and the Council to Homeless Persons are also developing four year plans for the child and family, community housing and specialist homelessness sectors respectively, and have been commissioned to implement these plans over the four year period. What will community services industry planning achieve? provide a unifying, longer term plan to support the industry. Who was involved in the development of the community services industry plan? In early 2017, around 100 community services representatives attended the The Social Service Sector of Tomorrow Industry Planning Symposium. You can download the post-event communique which summarises the event and outlines the top ideas which came from discussions. Consultation on the discussion paper was open for survey responses and/or written submissions in 2017. Throughout October 2017, VCOSS and DHHS also held four regional consultations in Bendigo, Traralgon, Benalla and Wyndham. VCOSS and DHHS produced a comprehensive discussion paper to guide consultation about the content and direction of the 10-year Community Services Industry Plan. The discussion paper was based on the 10 key priority focus areas developed through the planning symposium and subsequent feedback. It provided information about why each priority area was important, provided updates on work underway and progress to date, and ideas about future reforms. It also contained a list of questions to help guide consultation discussions and ensure the information gathered was relevant and targeted. This report captures the main discussions that emerged from those consultations, particularly looking at key priorities for consumers, carers, service providers and organisations, and what was currently working well, plus the challenges and opportunities to be addressed in the plan. The Future Social Service Institute (FSSI) was commissioned by the Community Service Industry Plan Working Group to write evidence reviews in 10 areas identified by the community sector as priorities. The reviews were designed to inform the Industry Plan and to gauge the future research needs of the community sector. All PDF documents are available in an accessible Word version. If you require one, please contact VCOSS on 9235 1000. If you’d like more information on the Community Services Industry Plan process, please send an email.